How to get Kids to Eat Vegetables! Parents, we have all been there. We have lovingly prepared a delicious meal only to have our children turn away in disgust. Your kids are picky eaters and you feel powerless to get them to eat healthy foods. Meal times have turned into your most dreaded time of the day. 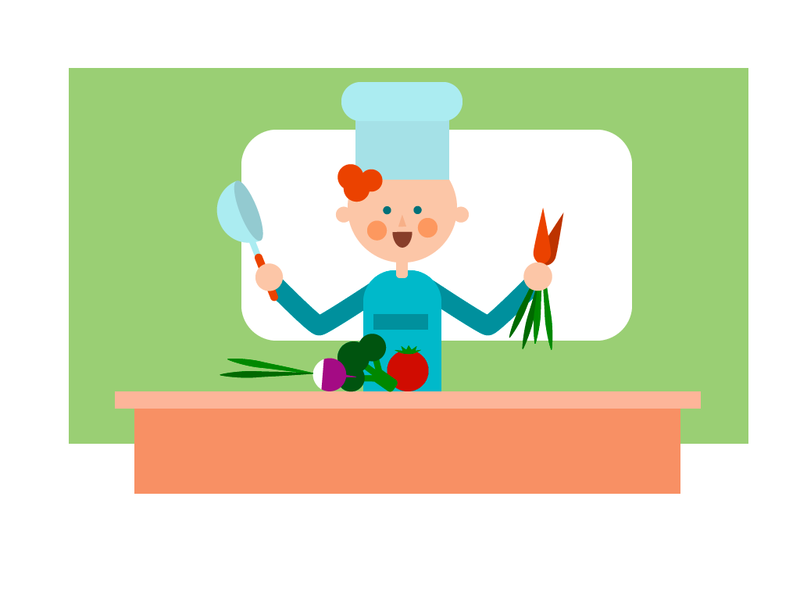 You feel guilty that you haven’t instilled in your child a taste for more healthy foods. Well, maybe it is time to take another look at our approach to feeding our children. 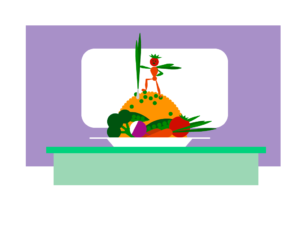 We are not bad parents, and yet we find ourselves fighting with our kids about food every day. We try in vain to encourage them to eat. We get angry, make demands and prescribe punishments. “No dessert for you later if you don’t eat your vegetables.” Or we will say, “you can’t leave the table until you clean your plate.” You might try a rewards like, “If you eat your carrots, then you will get dessert.” Then the problem is bargaining with them about the amount of food they have to eat to get dessert. All of this drives a wedge between the child and the parents. Finally, at dessert time, you may cave in and give your child dessert anyway, so you can have a moments peace. 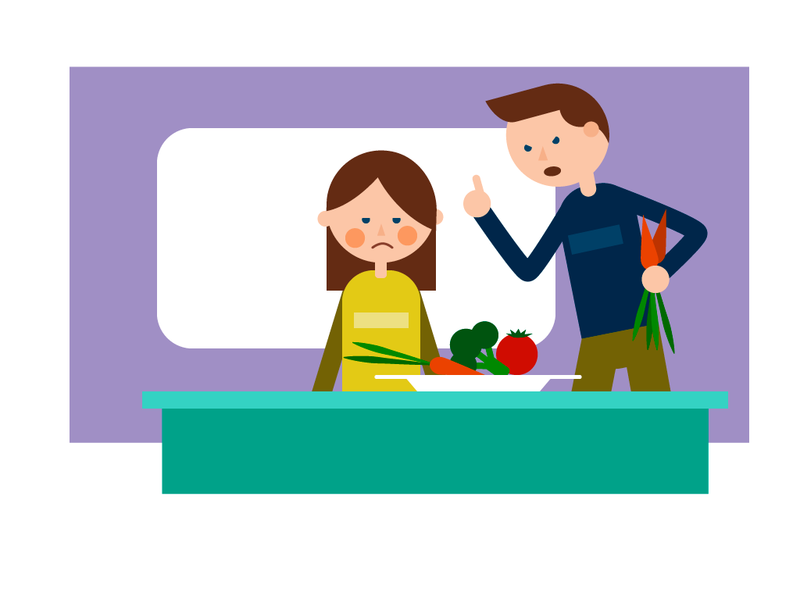 If this sounds familiar, read these 10 tips on how to get kids to eat vegetables without fighting at every meal. Do it for your sanity, and do it for your kids. Set them up for a lifetime of healthy eating habits, without having to yell, guilt, spank, force feed, bribe or punish them. Instead, these 10 tips you will learn how to get children eating vegetables naturally. There is no strong-arming required. You can get your kids ask for healthy foods by themselves. After about age 2, it is normal for a child to be picky. (1) They have new palates and everything tastes foreign to them. They are instinctively scared or suspicious of new foods. In nature it is better to beware of things that are unfamiliar and potentially harmful. It is also natural to like “rich” salty, sweet, or fatty foods and dislike bitter foods. Also, children do not have the same time perspective about delaying gratification. They can’t think about eating healthy now to avoid osteoporosis when they are a million years old. If there is one takeaway from my research, it is that fighting over food causes problems. Fighting creates a wedge between you and your children and makes kids dislike food. It’s true, studies show tough tactics cause kids to eat less fruits and vegetables. (2,3) How many of us remember a terrible food struggle with our parents? One time my dad forced me to eat a big plate of slimy spinach, and I gagged uncontrollably. It took me 25 years to eat cooked spinach again. Also, the “clean your plate” rule may be why I am a human garbage disposal today. Please share your own terrible food story below in the comments, I know you have one. The problem of how to get kids to eat vegetables, is similar, I think, to getting yourself to fall asleep. You may find that even if you want to sleep that you lay there with your mind racing. Since there is no “on/off” switch for your brain, you need to prepare for sleep. You set the stage by making the room dark and comfortable, silencing your phone, and relaxing. By setting these conditions you give yourself the best chance of falling asleep. 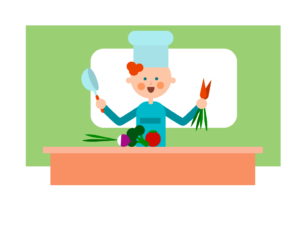 Learning how to get kids to eat vegetables is all about the setting the right eating environment. 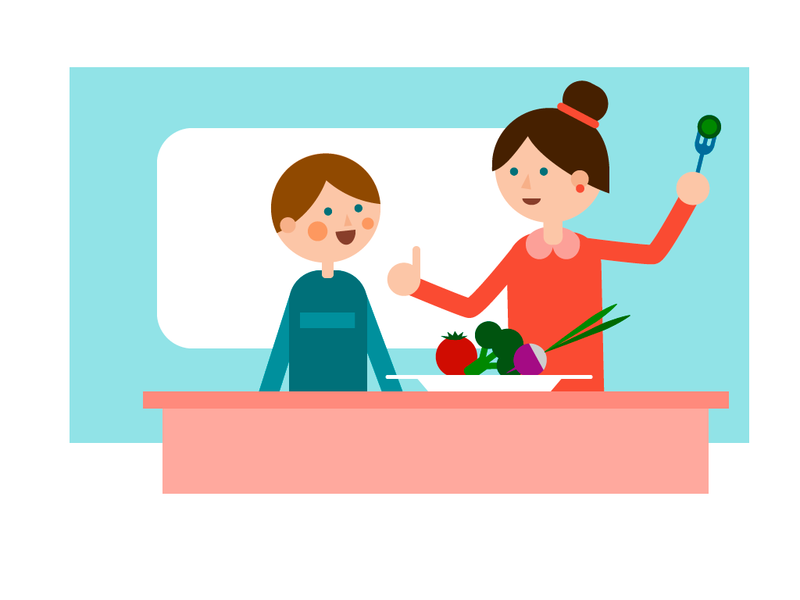 Follow these proven tips to set the stage for your kids to eat veggies. 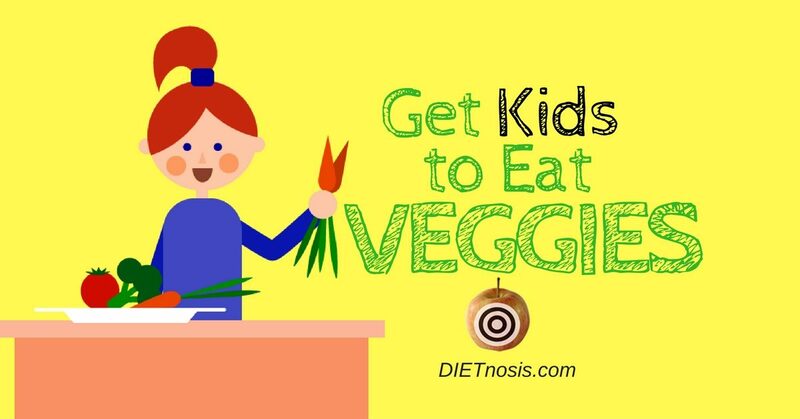 Here is How To Get Kids To Eat Vegetables! Today there is so much junk food around that natural foods can’t compete. Junk foods are addictive drug-like foods that make it so “you can’t just have one.” Food companies design them to be appealing with bright packaging and fun shapes. 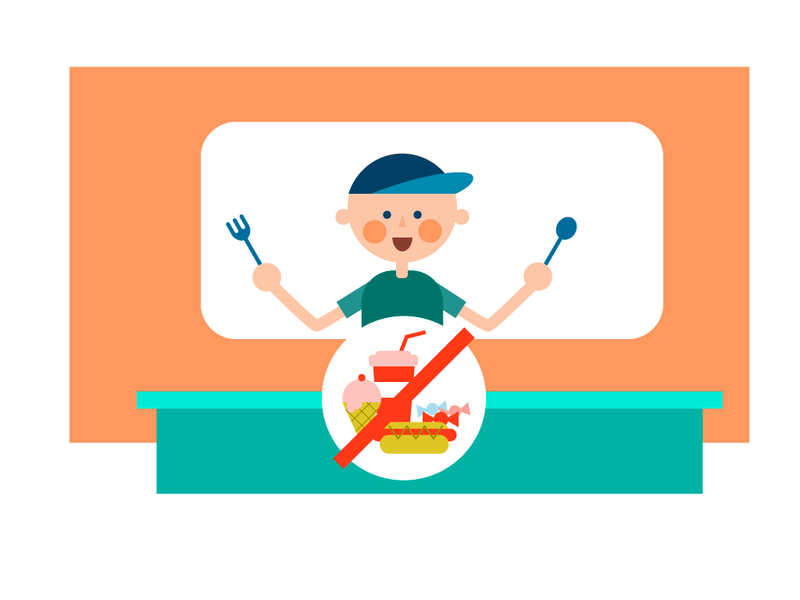 They call to our kids, “eat me, eat me!” So try your best to eat at home as much as possible and limit junk in your house. Normal food will seem gross when kids compare them to junk food. Indeed, out of sight out of mind is by far the best recommendation at that is why it is first on the list. So avoid fights about food by making rich foods scarce and healthy foods abundant. 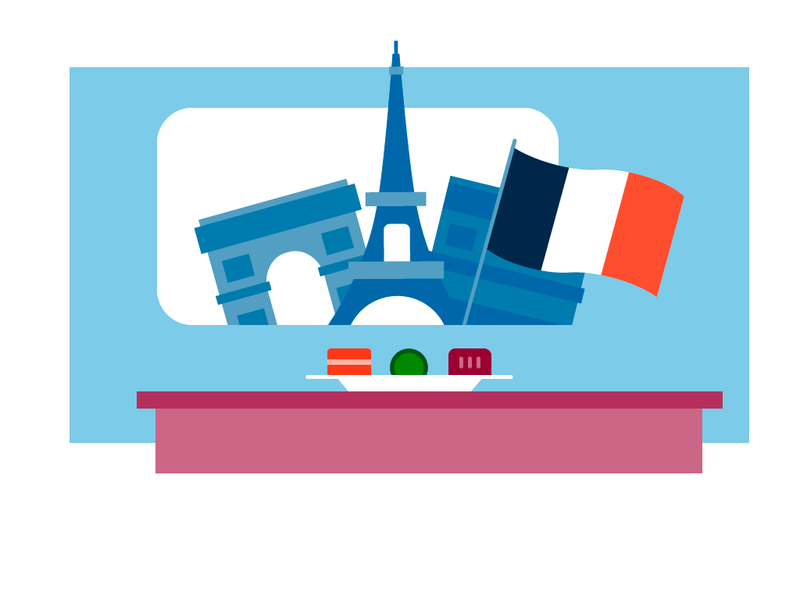 Eat like the French. Start with the veggies or salad first. Next include stand alone starchy veggies like potatoes, corn or squash. Serve dishes with flavorful sauces last (such as pastas with marinara). Eat fruit for dessert. Although fruit is healthy, its taste is so sweet and pleasurable save it for last. Treat your meal like a wine tasting. During wine tasting, you sip in sequence. Wine tasters serve strong and overpowering wines last. They don’t want to ruin the flavor of the subtle wines. So put weak flavors in a meal first. Cleanse your kids palate by having them sip a little water before a meal. Use a courses concept. This way, as kids wait at the table the food gets better and better. Don’t worry if one child hasn’t finished their course. If they are stalling, have them take a tiny taste and then clear their uneaten food for the next course. Limit waste with small portions. Sane portion sizes leave us wanting more and aren’t overwhelming to kids. Studies show that parents who eat veggies have children who eat veggies. Parents who eat more junk food have children that do the same. (5) Role modeling has much stronger effect than trying to reason with your young child. Seeing other people eat a particular food helps the child feel that the food is safe. Why would they trust any food that you do not relish or seldom eat? So be sure older family members eat veggies often and show the younger ones that you like it. (1) To ensure this works you must serve everyone the same food choices and avoid serving your first born child a “special meal.” (1) If you often model how much you enjoy dessert and other addictive foods, it will influence your kids to prefer these same foods. 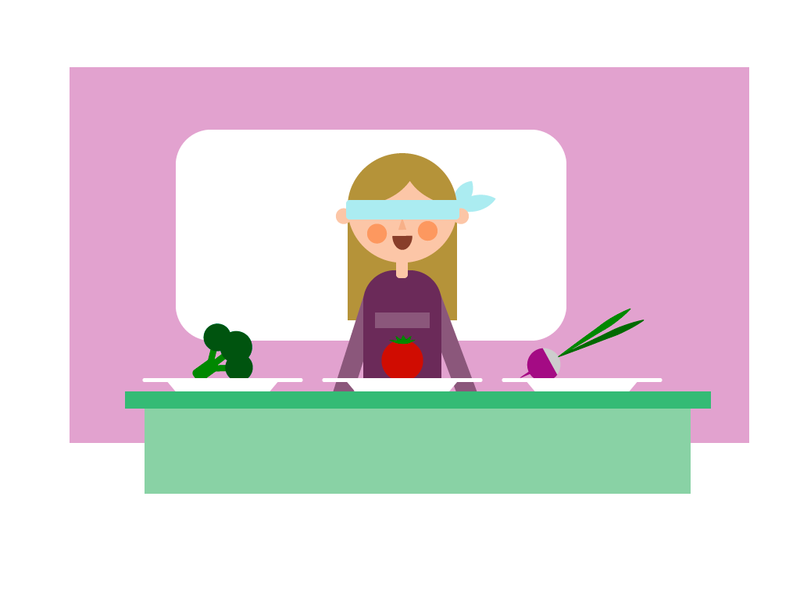 In this way, you can let your child’s intake be your nutritional mirror. Think about trying new food like being afraid of the dark. 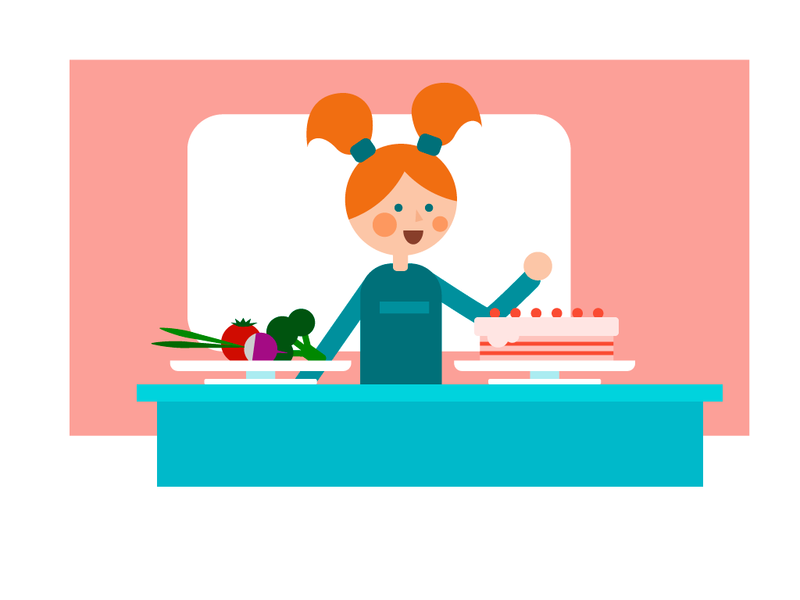 Trying a new food is all about a concept called “learned safety.” It takes about 15 positive experiences for a child to like a new food. (1,6) The key word is “positive” and force-feeding sessions do not apply. In a similar way, liking a new food, is like learning a new song. It takes about 10-15 times to know the song by heart. So do not expect to introduce a new food and have your child learn to love it all in one sitting. Tasting (small bits/fearful) is different than eating (large portions/relaxed). 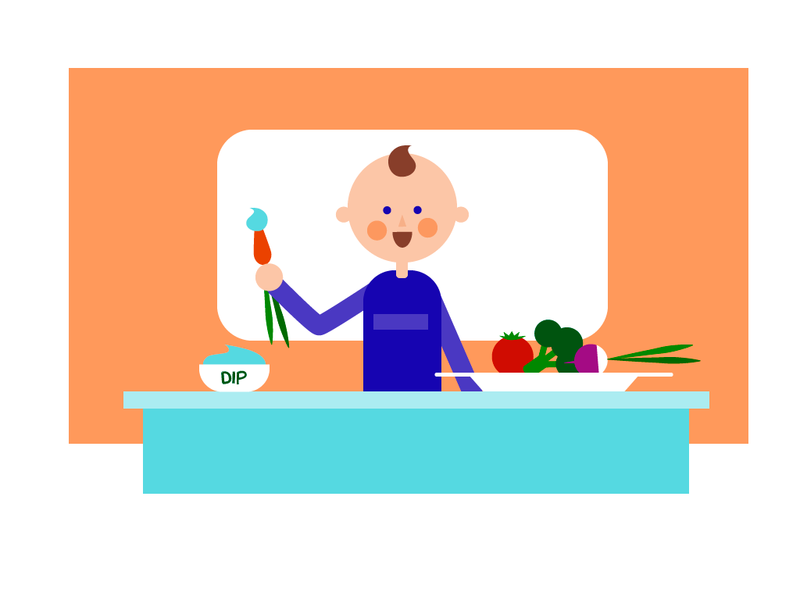 Wait to increase the portion size of a food until your child learns to like it and ask for it. If you can learn to crave bitter coffee and beer then there is hope for your child to learn to like vegetables. I recommend tasting sessions separate from meals and call it “taste-bud school.” Use tasting games to expand your child’s palate starting about at age 3-4. See which child is brave enough to try a new food. Add food chasers if needed. Chase new foods with a familiar food to limit the disgust factor and reduce aftertaste. As you know there are few if any plain vegetables ever served at restaurants. They are “doctored-up,” or “scattered, smothered and covered” until their taste is almost unrecognizable. We do it for our dogs and cats by adding canned dog food to the kibble. So include a flavorful condiment, dip or sauce with any bitter food you serve your kids. Dip veggie sticks or pita in hummus, celery into peanut butter, and fruit into non-dairy yogurt. Make a fruit topping by blending up berries. Slowly your kids will tolerate more and more vegetables. Consider how your coffee habit started. I’m sure you added sickening amounts of cream and sugar before you ever drank it black. By the way, avoid sneaking vegetables by pureeing the food and mixing it into well liked foods. It is counterproductive. Kids are smart. Once they smell a rat, they will lose trust in you and imagine you secretly poison their meals. Sometimes conspiracies are true. Besides, you want your child to learn to like the appearance of food so that they will actually learn to eat it. We know that the convenience of fast food encourages eating and is making us all “supersized.” But this concept works for healthy foods too. Make healthy foods easy to reach and always available. Keep easy to eat fruit out on the counter and prepared “ready to eat” foods at your kids eye-level in the fridge. Use a low kitchen cabinet or drawer as the place for kids cups, kid-sized plates, bowls, utensils, napkins and straws. Also, use the power of mindless eating by with natural food platters set close to the kids during TV or play. Let them take what they want. They will surprise you. When you come back the platter will be empty. To make food fun, start thinking and acting like a kid. If your “inner child” is in a coma, then steal some fun-food ideas from Pinterest. Have you heard about teddy bear toast, frozen banana penguins, lightsaber veggie sticks, the tacosaurus, rainbow fruit skewers or magic wands. 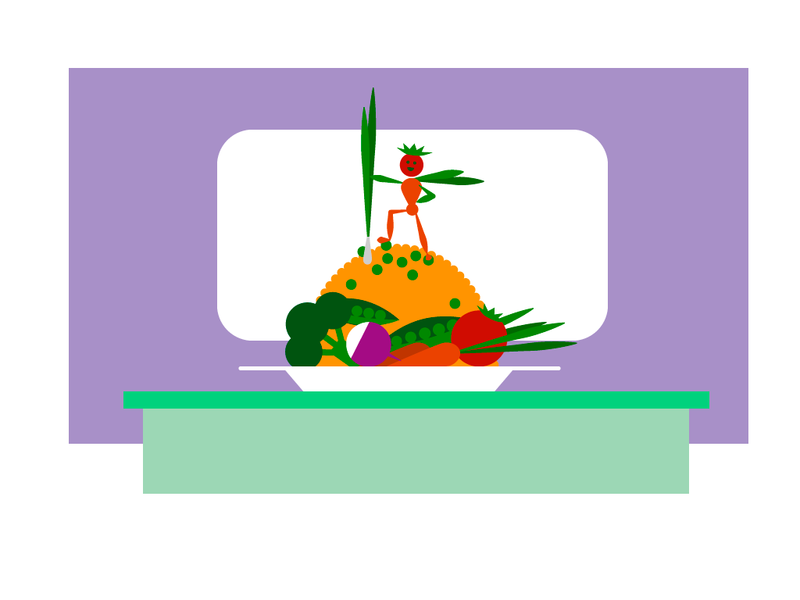 Ask yourself,…“Self, can this food look like an animal or my child’s favorite superhero?” Get creative. Can you freeze it it, make it into finger food, or float it in Jello? Can you put it on a stick or wrapped it in a burrito? Can you color it with food dye, or dust it with sprinkles, cocoa or powdered sugar? Can you serve the food in a toy dump truck or in a play tea set? (7) These great snack hacks are fun ways to familiarize your kids to a variety of fruits and veggies. Your dad taught you that you wouldn’t appreciate something unless you worked for it. This is also true about kids and the food they eat. Get kids involved with food planning, buying, cooking and cleaning process. 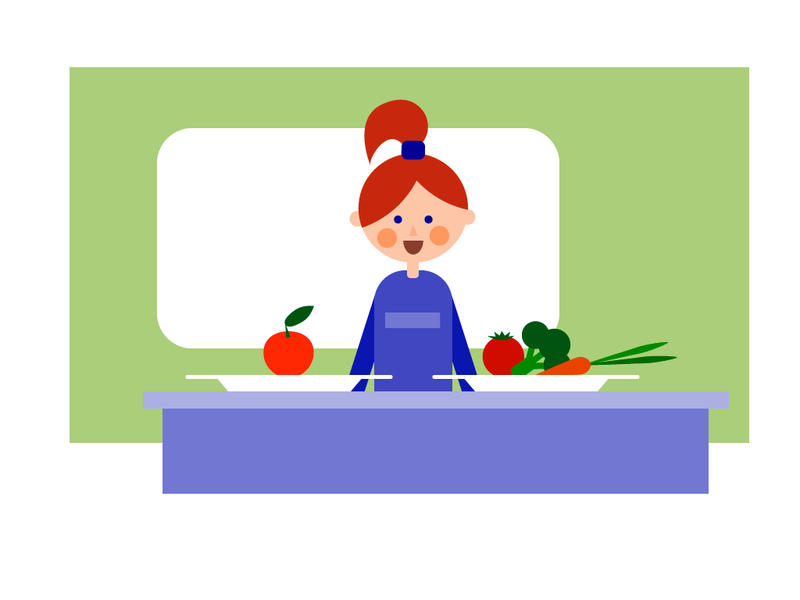 Have your child help with a shopping list and choose vegetables that they like or are willing to try. At the store, have them “treasure hunt” for the food. Try having them “find the 1-3 veggies that they want to try this week.” It is fun, especially, if they pick out a new vegetable that you haven’t tried before. At home, have them wash, peel or cut the produce. Kids love stirring, turning and watching the food while it cooks. It also lets them see what is in food mixtures so they feel less scared. Make them the official taste tester and ask if it needs something else. To “kick it up a notch” have your child help grow food from seeds or seedlings in a small garden or a few pots on your porch. Planting seeds and nurturing a garden provides a deep understanding and appreciation for food. Thank you so much for reading. It’s never too late to get your kids on a healthier diet. If you liked this article, then subscribe to dietnosis.com below. Send me questions you would like to have answered here by commenting. You can also contact me on Twitter (@DIETnosis) or on Facebook. Hi, I’m Dr. Harrington, and I made Dietnosis to help you focus on weight loss techniques that match your Personality Type. 2. Savage, Jennifer S, Jennifer Orlet Fisher, and Leann L Birch. “Parental influence on eating behavior: conception to adolescence.” The Journal of Law, Medicine & Ethics 35.1 (2007): 22-34. 3. Patrick, Heather et al. “The benefits of authoritative feeding style: caregiver feeding styles and children’s food consumption patterns.” Appetite 44.2 (2005): 243-249. 4. Daniels, Lynne A et al. “The NOURISH randomised control trial: positive feeding practices and food preferences in early childhood-a primary prevention program for childhood obesity.” BMC public health 9.1 (2009): 1. 5. Natale, Ruby A et al. “Role modeling as an early childhood obesity prevention strategy: effect of parents and teachers on preschool children’s healthy lifestyle habits.” Journal of Developmental & Behavioral Pediatrics 35.6 (2014): 378-387. 6. Cooke, Lucy. “The importance of exposure for healthy eating in childhood: a review.” Journal of human nutrition and dietetics 20.4 (2007): 294-301.